For the kid in all of us...but also the design junkie. They are gorgeous. Handmade. Weather-proofed wood. Made in Montreal. We are thrilled to welcome ULAT Dryer Balls to the Spruce collection! Handmade in Vancouver from 100% Canadian Merino Wool, these little babies work magic on reducing your dryer use and your energy bills! We were delighted to discover the incredible work of Aly Nickerson shortly after opening last summer. 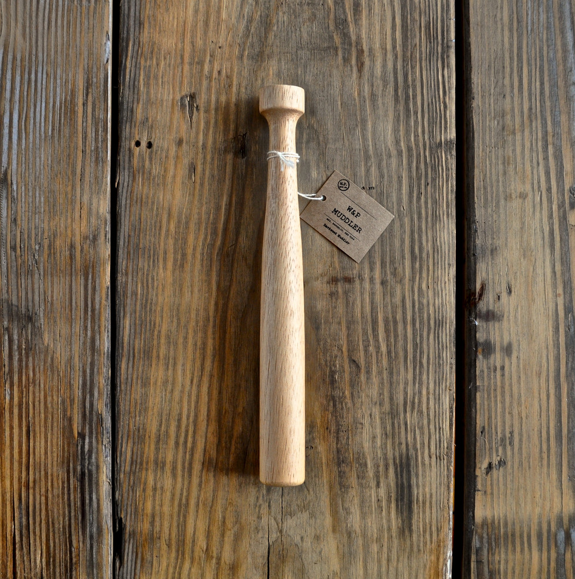 Thanks to her discovery of a vintage letter punch, she paired this with an incredible selection of vintage silverware and her fantastic works were born. 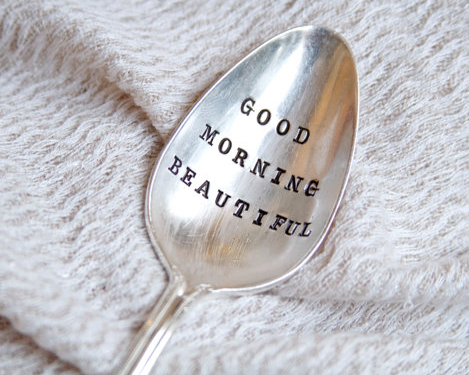 Adorable messages are letter-by-letter stamped onto spoons, forks and other unique vintage pieces. 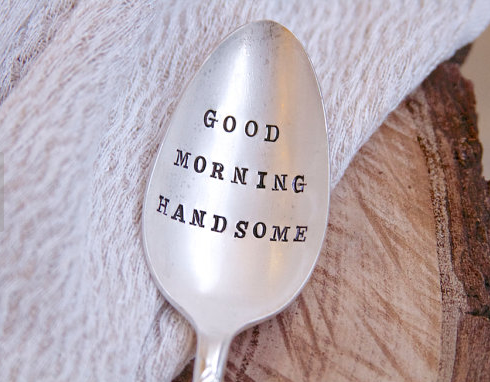 Think about waking up and looking down to see you're holding a spoon that reads "Good Morning Beautiful" or sharing your first bite of wedding cake with your new life-partner using a fork that says "Mr." or "Mrs." - it doesn't get much cuter than that! Words don't do them justice so have a look! We are so excited to add a new line of lovely fragances made by small-batch perfumer Margot Elena. Library of Flowers is an absolutely delicious line that includes bath products, creams, candles and incredibly unique parfum de crema. We brought in her newest "Story" of scents called The Forest. Hints of moss, bark and foresty florals make the three fragrances in this line really special. And her packaging can't be beat - think bubble bath in olive oil tins, parchment-wrapped soap in wooden boxes and triple-wicked candles in glass jars. 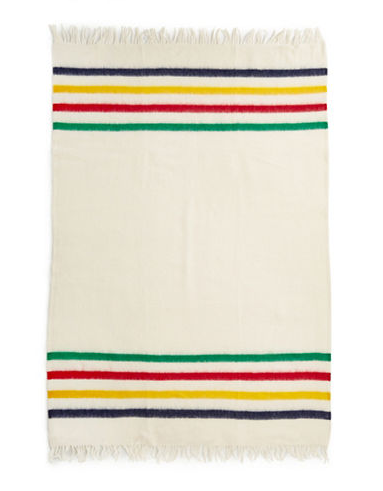 Spring may seem like it's a long way off but you'll be transported to warm days thanks to this new line! Inspired to remain indoors for most of the winter this year (thanks polar vortex), we managed to keep ourselves busy by studying a bit of mixology! 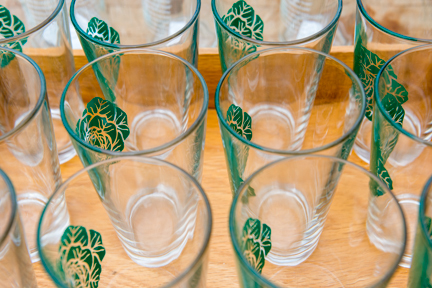 Thanks to a few new products, our fun with cocktails can continue well into the spring and summer. 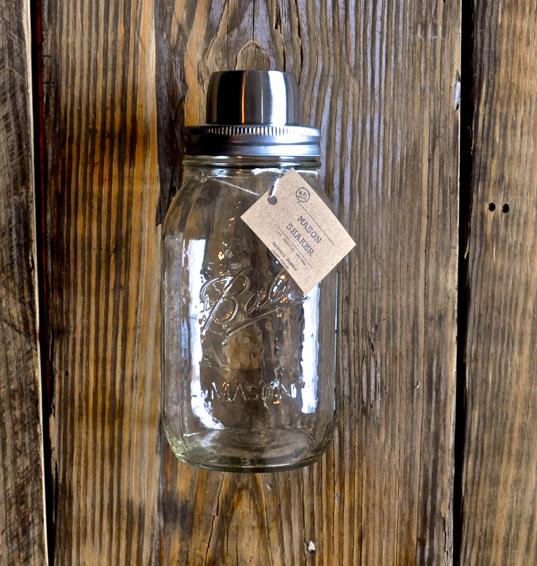 We've brought in a vintage-inspired line of cocktail accessories designed and made by Mason Shaker in Brooklyn that includes wooden muddlers, stainless steel jiggers and shakers constructed using mason jars. If you're looking for a little bit of instruction, the guys published a fantastic recipe book that offers delish ideas for every season of the year. As we are beginning to unwind after the (fantastically busy) holiday season we have had a chance to look back on the first 6 (now 7 by the time I am writing this) months of Spruce. We feel nothing but blessings and gratitude for all the support we have received right from the very beginning - the weeks of renovation, the nerves to open our doors, the first sale, the gorgeous summer months that brought in so many lovely new neighbours and friends, and the incredible love-filled holiday season. We thank each and every one of you. Yesterday we received the news that Spruce has been voted Top 3 New Design Stores in Toronto by BlogTO. Now in 2014 we have so much to look forward to - the coming of Spring given these crazy temperatures is number one on the list! But other than the return of warm days, we are so excited to continue to showcase new and local artists who take such pride in producing unique and high quality works. Some of the best feedback we have received is that our clients are keen to shop local and handmade so our promise will be to bring more of this to you in the coming year. So on the eve of Spruce's 7 month birthday we wish everyone a happy and prosperous 2014 - make your dreams come true this year! 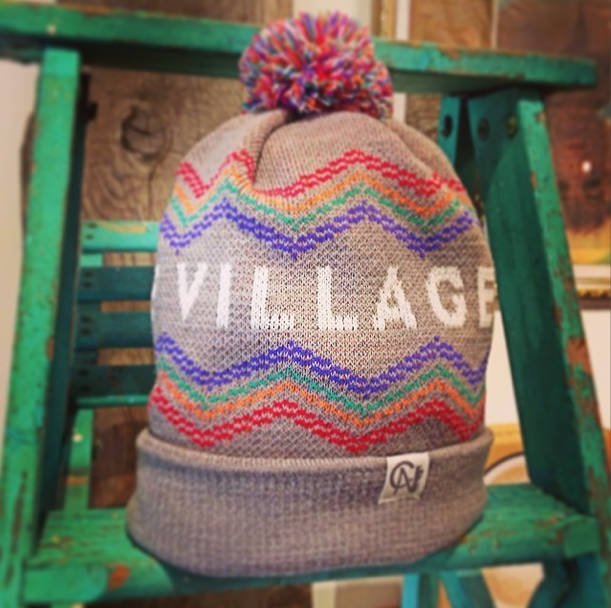 Our newest LOVE: Tuck Shop Trading Co.'s City of Neighbourhoods toques! Locally designed and locally made - a growing number of proud neighbourhood-headed Torontonians are touting their 'hoods with pride. Check out their "How It's Made" video here! 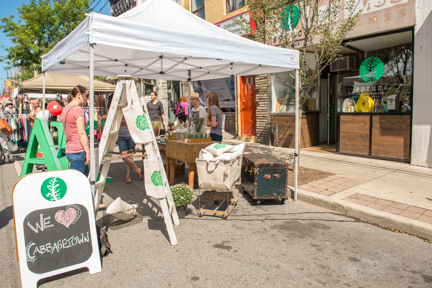 This weekend marked the 37th Annual Cabbagetown Festival of the Arts - from Thursday through Sunday the neighbourhood was a-buzz! Whether it was a pub crawl, the kick-off of the artists in the park or a live band in the sun on Sunday, it was fantastic on all accounts! We were lucky enough to partake in our first Cabbagetown Festival (as local business owners versus patrons) this year and loved every minute of it. Despite a little drizzle (read: a lot) on Saturday, the crowds were cheery! We met so many fantastic people from all parts of the City and the Country! In honour of our favourite spot in Toronto we worked hard with our fabulous suppliers to produce some very special "Cabbagetowner" kit ... from pillows and totes by Toronto's Nicole Tarasick to glassware by Vital Industries of Colorado to THE most adorable crocheted cabbage toys by Atomic Ami to lovely cabbage stationary sets. If you have been in to see us recently, you would have noticed our new "installation"! We recently met one member of the dynamic duo behind Bon Cru Crate Designs and were introduced to some of the gorgeous pieces they create from imported wine crates. "Two high school friends who were once separated by their studies, reunite with a common vision of creating personalized art and furniture designs. Over a good bottle of wine and after some family feedback the name “Bon Cru” was derived and the journey began. Bon Cru is a French term meaning “good vintage”. Here, vintage applies not only to the wine trade but also the character in our natural products. You will find as you learn more about our company that our products are exclusive and often tailored to the homeowners’ desire. Thriving to meet the demand for unique, quality handmade furniture has been a continued goal while remaining focused on our core values and sustainable building practices." 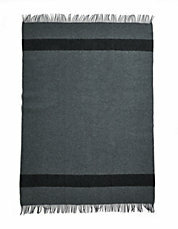 Custom-designed, refined quality, one of a kind, locally made. Today marks exactly one week since one of the most special nights we have ever been a part of....Kim's little sister's wedding. The breathtaking, Kelly, and prince charming, Scott, finally acquired their 'husband' and 'wife' titles last Saturday in Kim's parents' backyard in the perfect little town of Courtenay, BC. There were quite a few to-do lists to check off during the days leading up to the big event...this included, but was not limited to 'puffing' 100 tissue puffs, designing over 75 flower vase arrangements and chalking up over a dozen wedding signs. Where there was stress there was always laughter and where there was a late night there was always wine. We reunited with family as though we have never been apart and we met some pretty incredible people who we hope to keep in touch with in the years to come. Kim and I had a brilliant time and we're truly honoured to have taken part in it all. Congratulations to Kelly & Scott! Whether we're sitting across from you at the kitchen table or provinces and time zones apart - we adore you and wish you nothing but a lifetime of love and light! Therese Bombardier we love you! We jumped for joy today when the postman delivered a box full of gorgeous vases, mugs, tumblers and coasters - all hand-made in Halifax. Therese is a master - she hand-presses her pieces with antique lace and glazes with the most elegant tones (Palladium, Bright Scarlet, Dark Caribbean, Foiled Chocolate to name a few). We were introduced to her work in March and, needless to say, she was one of the first artists we contacted when beginning to stock our shelves. Pictures speak louder than words so feast your eyes on a few of her pieces below! Our fave local chef (who happens to be our great friend and neighbour) has recently created a line of fantastic syrups and preserves. Her products are created from carefully curated ingredients sourced as locally as possible and made by hand in small batches. As the seasons change, so will Fink's products. 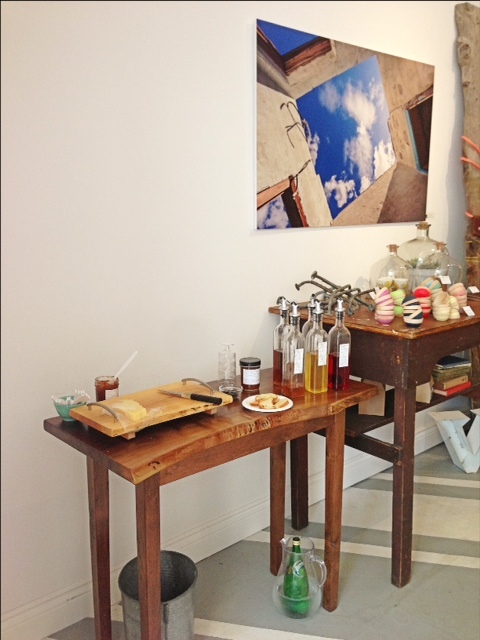 Fink has hosted two incredibly successful tastings during our first two weekends. We've received amazing feedback on the delectable syrups and we can't keep the Branston Pickle in stock. Pop-Up Paris. Have you heard? We are the lucky ones in Canada who are the only stockists of these fab Parisian candles. They smell amazing (wood smoke anyone? ), they look great, and one in fifty is host to a quarter carat diamond! "Combining our french savoir-faire and the thrill of the lottery, Popup Scented Candles will excite, delight and maybe even surprise their owners. Inside every fiftieth candle, the lucky customer will find a diamond shining brightly at him through the melting wax! 1 in every 50 candle has a G .VS-SI quality diamond hidden inside it"
All we can say is we LOVE them. And we can't wait for the phone call from our lucky customer(s) to announce their win! Oh what a week! We are celebrating our one-week anniversary today and are so grateful for the show of support from Cabbagetowners and Torontonians alike. Thank you to everyone who has come to visit, facebooked, tweeted, instagramed and emailed...if you haven't been in to visit yet, we look forward to meeting you. Georgian Bay on Lake Huron is officially our new fave place, thanks to these amazing gems that were hand delivered to us by their creator on Friday. These will change the way you look at toothpicks forever. Think: CinnaMint, Salted Birch and Single Malt. A lovely lady here in Toronto creates these beauties from vintage silverware. Our keys are already singing with joy thanks to their new accessories. Our DIY Cheese Kits have arrived and we have a feeling some of you will be hosting some fun cheese-making parties over the next little while. Be sure to send/tweet/facebook pics of your creations. On Friday, June 7th we were honoured to host a little soiree with some of our closest friends and neighbours - at our finished shop! Spruce (on Parliament) has been born. 455 Parliament Street has survived and thrived in the heart of Cabbagetown for decades, has had many faces and hosted many families. We are thrilled to say that we live here now. We opened our doors to the public on Monday, June 10th and have been overwhelmed by the support we've received. Our shelves are steadily filling with unique, vintage, and hand-crafted items that we hope will find a place in your hearts and your homes. We look forward to a happy and continued relationship with our favourite Toronto neighbourhood, the one we've called home for almost a decade. Those who know us, know our history with renovation projects: we love them and it seems as though we are always in the middle of a project. 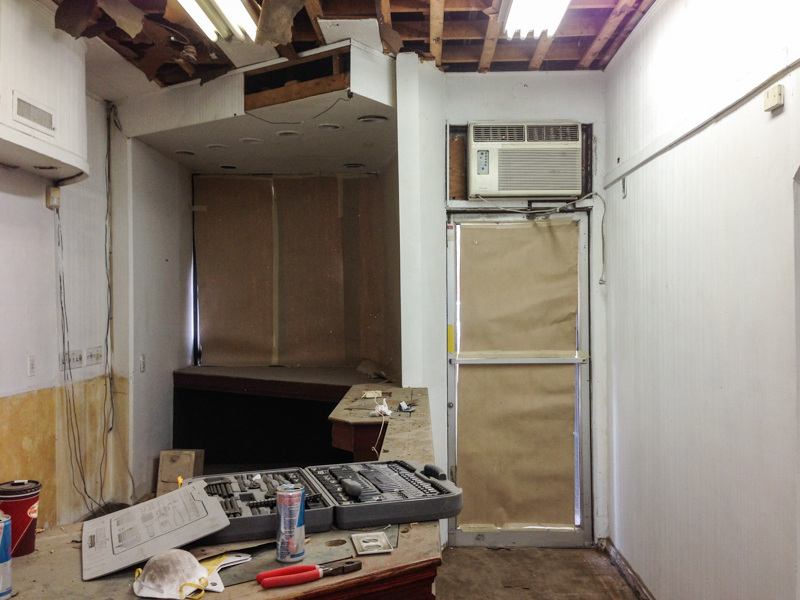 Lately, we have been toiling away at transforming our newest space and our newest adventure. Ceilings have been torn down, walls demolished, carpets removed, brick refurbished. And that's just the start of transforming our space, on Cabbagetown's Parliament Street, which was the home of 2-4-1 Video for over 20 years.